Nancy: Our guest today is national bestselling author Jesse Hayworth. 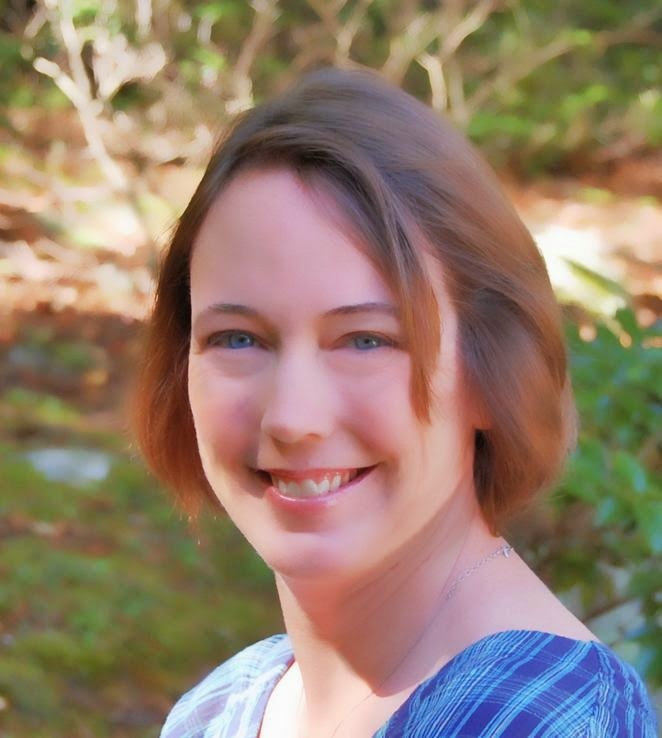 She’ll chat with us about her new release, Harvest at Mustang Ridge and about the various series she’s written. Welcome, Jesse! What drew you to writing fiction? Jesse: I’d say it was a quarter-life crisis, really. I was finishing up my PhD in Genetics and wasn’t sure what I wanted to do next, either with my career or my love life. So I asked myself “What if?” What if I could do anything next? What if I didn’t stay in science? What if my fiancé was out of the picture? Somehow all those what ifs turned into a story about a woman who, after her researcher fiancé’s suspicious death, quits science and retreats to her aunt’s horse farm to grieve. Of course, there is the mystery of her fiancé’s death to solve, a romance with a hunky photographer who is also caught up in the danger, a cute little kid, ponies, horses, family … in the end, I had almost a thousand manuscript pages with two main plots, a gazillion subplots and five different endings. And I had so much fun with it! More than I was having in the lab, really, and after I took a step back and looked at what the story was telling me, I made a big leap of faith. I finished my degree, left the lab, and worked at a barn for several years until I finally sold a book to Harlequin. Part of me wants to say that, hindsight being 20/20, I probably should have made some changes back then in the fiancé department, too. But, really, all of the experiences I’ve had along the way prepped me to be in the right place at the right time to meet and marry my wonderful husband, Arizona, a few years ago. (We both agree we weren’t ready for each other in our twenties or early thirties.) These days, I write full time, edit scientific articles on a freelance basis, and always put down what I’m doing and give hubby my full attention when he walks into the room. Nancy: Please tell us about the Mustang Ridge series. Jesse: Mustang Ridge Ranch is located in beautiful northern Wyoming, where the mountains hunker in the near distance and the wild mustangs roam. The ranch has been in the Skye family for more than two centuries, and for most of that time, it’s been a top-notch cattle station. But the times they are a changing. Six or so years ago, fresh-out-of-college Krista Skye went up against her grandfather, Big Skye, and swung the family vote to transform the cattle ranch to a high-end dude ranch that offers guided trail rides, roundups, Gran’s down-home country cooking, and a whole lot of hunky cowboys to round out the package. And with Krista, her twin sister Jenny, and a whole lot of single ranch employees and guests coming and going, there’s no shortage of potential for romance! The series leads off with Summer at Mustang Ridge, Winter at Mustang Ridge and Harvest at Mustang Ridge, with more coming in 2015. 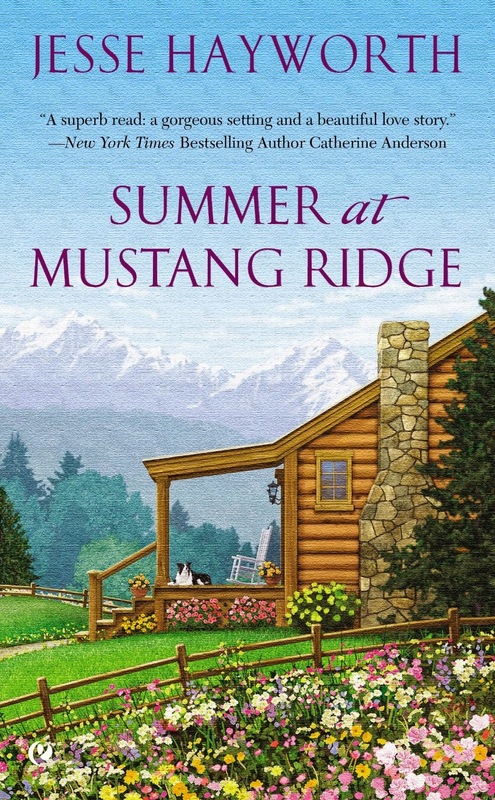 Nancy: Horses play a huge role in the Mustang Ridge books. What’s the best thing about horses to you and how does that influence these books? Jesse: Growing up, I always felt like an outsider—geeky, awkward, off and on chubby, and always liking the wrong stuff and wearing the wrong clothes—except where it came to horses. Sure, I couldn’t afford my own horse for a long time, and even when I could, I didn’t have the newest equipment or the trendiest clothes, and I didn’t go to the biggest shows. But that’s people stuff. Horses don’t care what brand name is on their tack as long as it’s comfortable, and they don’t care what their humans are wearing. They care that you’re gentle and fair, that the same command always means the same thing, and that good behavior gets rewarded. That’s an important facet of Mustang Ridge, in fact. From Summer at Mustang Ridge, when a child finds her voice again with the help of a slow-to-develop foal, to the new Harvest at Mustang Ridge, when a wild mustang teaches Krista and Wyatt a few things about being good to each other, horses are woven into the fabric of the dude ranch experience and the love stories that flourish under the wide-open sky. 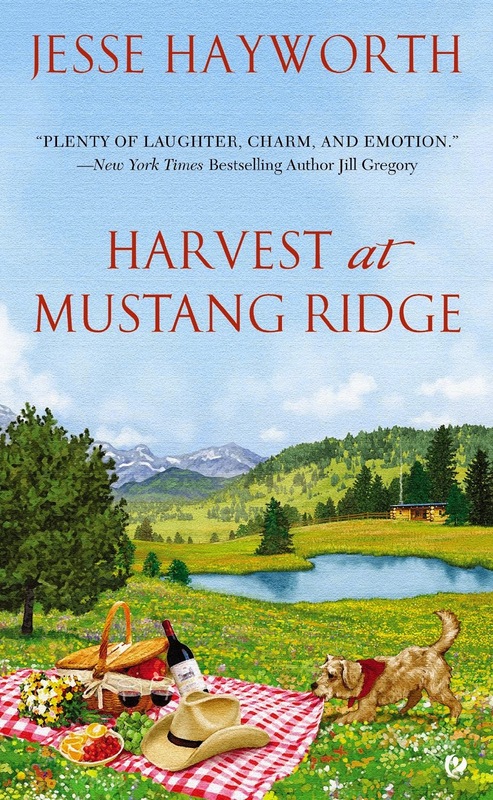 Nancy: Who are the hero and heroine of your new release, Harvest at Mustang Ridge, and what’s their story about? Nancy: Will you be doing any more of Mustang Ridge in the near future? Jesse: Absolutely! Firelight at Mustang Ridge will be available next February, with Another Fyne Thing (a Mustang Ridge e-novella) following in late spring, and Coming Home to Mustang Ridge (tentative title) releasing in the summer! Nancy: In addition to working with horses, you have a science background. How have you drawn on that in your writing? Jesse: Yes, ma’am! I wrote more than twenty-five romantic suspenses for Harlequin Intrigue, most of which are either set at my fictional Boston General Hospital (seriously, I don’t know why anyone would ever go there, what with all the nefarious plots and steamy rendezvouses going on!) or involve the forensic side of police work, especially DNA analysis. I’m excited to get back to that soon (more on that later!). Nancy: Your first series, The Nightkeepers, was Mayan-themed paranormal romance written under the name Jessica Andersen. What drew you to that type of story? Jesse: Pure and unadulterated geekdom. LOL. I love ancient civilizations, mythology, archaeology, anthropology, and any other –ology that talks about old stuff, new stuff, the collective unconscious and how they all fit together. I also love hot romances and action-adventure stories, so when I stumbled on an article about a Mayan-prophesied apocalypse, I was all, “Indiana Jones stuff, sorcery, paranormal romance and ancient Mexican pyramids, oh, my!” Eight books and a novella later, and I still adore the Nightkeepers and their world. Nancy: Do you currently plan to write any more Nightkeepers adventures? Jesse: I’ve toyed with the idea. I think it would be cool to revisit the Nightkeepers and see how their lives have changed since they averted the apocalypse and sealed the barrier between the earth and underworld, seriously altering their magical powers. But at the same time, I feel like the series came to its natural conclusion, and I have a great deal of respect for storytellers who stop before the audience loses interest (new Battlestar Galactica, anyone?). So I can’t say for sure if there will be more Nightkeeper books. I can, however, promise that there will be some new Jessica Andersen medical romantic suspenses soon, though! Look for the first two or three books in the tentatively titled Outbreak Incorporated series sometime next year! For more about Jesse, you can check out her website: www.jessehayworth.com or her Facebook page www.facebook.com/docjess. You can also connect with her on Twitter, where she’s @JesseHayworth. Jesse and Nancy, thank you so much for a terrific interview! We appreciate you both taking time from your busy schedules to visit The Romance Dish today. Readers, what if you didn't stay in your current profession/situation? What if you had the opportunity to do anything you wanted? What would you do next? One randomly chosen commenter will receive the signed backlist Jesse Hayworth book of her choice J. Like many research scientists I think, I wouldn't want to move out of science but maybe move from quantum physics to quantum biology.... and definitely move to more blue skies and less blinkered contract work. Jesse, did the genetics research get a bit tedious, staring down that microscope for long hours. Great move to write romance though. I think I might try your suspense books. A deeper inside knowledge of hospital labs could definitely increase the plausibility, as with Michael Palmer's medical thrillers. Love Michael Palmer! My suspenses are definitely sexier, but there's a good bit of science in there, too. I'm working on one right now, and love getting back in that head space! I love medical thrillers. After the double recommendation, I definitely need to check out Michael Palmer! Quantum, I've read Jesse's suspense books. I particularly love her Bear Claw Creek Crime Lab series. As a non-science person, I think all forms of science are fascinating and am always looking for news or stories I can actually wrap my history-major head around. I was in a career I loved, one I chose at an early age. But if I could pick a different one nkw, I think I would pick a baker. I love to cook, especially cakes, so I think that would be fun. Hi TrishJ. I'm happy to hear that you loved your career and made a great choice early on. Way to go! But a baker? Love it. I enjoy watching those cake decorating competitions on the Food Network--love seeing people do stuff that's way out of my wheelhouse, and doing it well. And, well, CAKE! Jesse, aren't those shows fun to watch? I'm blown away by the creativity of some of those people! Soo cool! I mean, the stuff some of them can do with Rice Krispies, fondant and chocolate ... Wow. Trish, how cool that you bake! It's the one form of cooking I actually like and am fairly decent at, though I have no creativity at all in the kitchen. I occasionally think of taking one of those cake decorating classes, but I never seem to actually do it. Maybe one of these days! Congrats on having a career you loved. That's rare. PJ! Hi, and thanks so much for having me (and to Nancy for the fab interview)! Ha ha on the late night--lucky you :) Thanks for the warm welcome, and we'll see you later! PJ, thanks for having us. I'm getting a late start today due to a hectic morning, but I'll be back later! Jesse, you're always an easy interview, so I was delighted to do it. Anything I want? Hmmmm . . . while I enjoy being a lawyer, I'd have to say writing full time is the dream. Maybe some day . . .
Great interview, Jesse and Nancy! Can't wait for more of Mustang Ridge. Hey, Regina! (And a shout out--folks, now is the time to order Regina's debut Blaze, TRIPLE THREAT, which rocks!) Thanks for stopping by to visit, and sending you good 'full time writer' vibes! Hi, Regina! Thanks for stopping by! Regina, thanks! I was a lawyer once, a long time ago in a galaxy far, far away. I miss using that part of my brain, as writing seems to use different parts. Congrats on your upcoming debut! Great interview. We're all so lucky you decided to leave the lab and write full time! Thanks, Linda! I'm also glad Jesse bailed on lab work for writing. You can probably tell I totally love her books. I love what you said about stopping what you're doing when your husband enters the room. Sometimes it's hard--and maybe I tense just a little when I'm right in the middle of a scene, but I completely agree with you. As for your question, I've been blessed with a husband who has always encouraged me to do what I love most--be a stay-at-home mom and now be a full-time writer. Great interview! Thank you, Suzanne! And, yes, sometimes I have to remind myself to smile when I get that holler of 'Sweetie? Do you know where my XYZ is?' when I'm writing. But I so appreciate how he never snarls at me when I interrupt his stuff, so I try to return the favor. And the truth is, I'm happy to see him, whenever and wherever :) Congrats on your life path, and hubby's support! Sounds like you found a keeper, Suzanne. Good luck with your writing career and enjoy that stay-at-home mom time. They grow up way too fast! Suzanne, it's so great that you're in sync with your hubby and have been able to follow the track you wanted to. My husband encouraged me in the same way and still supports my writing goals, even though our son is in college now and so doesn't need (or want) daily mothering. Jesse, you know I love your Mustang Ridge series! Congrats on the new job, Laura! The trifecta of benefits, salary and paid vacations sure makes is hard to say no. LauraL, congrats on your new job! I'm sorry the early retirement plan hasn't worked out yet, but there is, as you say, a great plus in paid vacation. One of the things I miss about my former job is the paycheck. The other is having people around if I want someone to talk to. The dog is great company but not much in the conversation department. Nice interview, ladies. Wow, Jess, you are prolific! I get brain freeze just thinking about your production schedule, LOL. Looking forward to more of you Rom. Sus. You really have a gift for blowing up stuff at just the right moment in a story:-) As for doing anything else with my life, I have a hard time picturing myself doing more than I already do...maybe having more time to do it all would suffice. Any tips for balancing the promo part of writing while still getting words on the page? Thanks, PJ! (Check out PJ's young adult books, folks!) I do so like blowing stuff up ;) As for the balancing act, I'm still trying to figure that out for myself! My best advice is to only do stuff that you find at least a little fun, and give yourself a set amount of promo time per day or week (and that includes hanging out on FB!). Otherwise, it's far too easy (at least for me) to turn to promo when the writing gets hard, on the theory that 'at least I'm still doing something productive.' Thing is, the writing needs to come first! PJ, glad you enjoyed it. Yes, Jess's output is amazing. I hope you find that extra time. Jesse and Nancy, thanks for the interview and post today! I really enjoyed it. 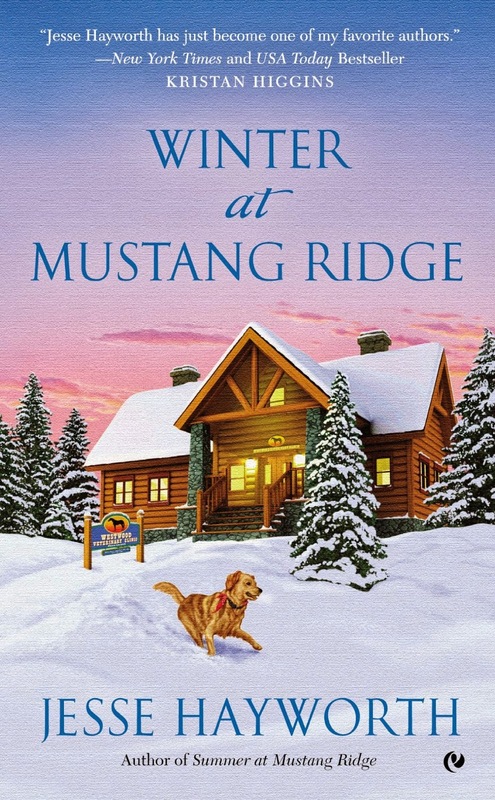 You are a new-to-me-author, Jesse, and I really like the setting for the Mustang Ridge stories. Of all the statements you made in today's post, the one that stood out was that when your husband walks into the room, you put everything down and give him your attention. Wow! I am a teacher. I have 6 "official" years left, and even though I love teaching, I am looking forward to ending that phase of my career. My sister and I talked about buying a bookstore about 10 years ago that focuses on children's books, but we didn't have the money nor the time. Big mistake. The gals who took it over are doing a tremendous business and are successful with it. I'm not sure what I would do if I had could choose another career...I've always been a teacher! Thanks for being at TRD today. Deb, thank you! I'm sure you'll find something rewarding to do in your second career, and I wish you luck with it. Bookstores can be dicey propositions, as you know. There was one here that had been in business for a long, long time selling children's books and high-end toys, and it folded after a couple of changes in ownership. You just never know. Thanks for the warm welcome and the kind words, Deb! I do hope you'll check out Mustang Ridge--it's near and dear to my heart :) Kudos to you for being a lifelong teacher! Arizona taught high school math for a number of years, and I know he misses parts of the job. Several of his former students have remained friends, though, and sing his praises. Nancy, rule of 88 means the number of years you've taught + your age, subtract from 88, then divide that number by 1/2 = the age in which you can retire from teaching to get full IPERS(Iowa) benefits. Bn100, we love to travel! I love to travel. If it weren't for my dog, my dream job would be international travel journalist/photographer. Catslady, thank you! I'm so glad you like the mages and the cowboys. Jesse and I met when I sent her a gushy fangirl email about the Nightkeepers via our mutual friend Anna Sugden. She was nice enough to overlook the gushiness and chat with me about her books. I don't think I could be a vet because I couldn't maintain the objectivity they have to with dying animals. I'd like to do something with art, but I don't know that I'd like the business aspects of that. oooh... I work in healthcare and I would love to switch from people to dogs :) Thanks for sharing and congrats ladies on the new release! Hi, Erin--It's Jesse who has the new release, and I can't wait to read it! I love this series. I admire your ability to work in health care. That would be tough for me. Fantastic interview Jess. Can't wait to read your latest. Hey, renovations are work, too! (Potentially lots and lots and lots of work!) Hoping you get that chance, Sharlene :) And thanks for checking out the interview. Sharlene, I hope you get that chance, too. Thanks for stopping by! I just wanted to tell you how much I've enjoyed this series!! They are awesome and I'm anxiously awaiting the next one. Martha, aren't they great? Thanks for stopping by! Jesse and Nancy, thank you so much for today's terrific interview and for taking time from your busy schedules to visit with our readers. We greatly appreciate it! Jesse, I'm enjoying the Mustang Ridge series so much and am thrilled to know there will be more books coming! PJ, thanks for having us! Ditto Nancy! It was a real pleasure hanging out with you guys today, and thanks so much for your support of Mustang Ridge :) Hugs, and happy reading! I've always worked with children - in one capacity or another. I'd love to go back to maternity. The series does look fantastic. I'm currently in property management. Since the economy went bust in 2008, we've been in & out of the Court system getting rid of non-paying tenants, even after credit and background checks! I'd love to retire an visit all the national parks. At 60 plus, I am still trying to decide what I want to be when I grow up. I would like to be a travel and tour director and guide. It would allow me to travel and research the areas we are going to visit. Adaptive tours for the older generation would be a nice option. Just because getting around may be a bit more difficult, doesn't mean one shouldn't be given the opportunity to see the world and have new experiences.